All sets feature Wera's multiple position head, ergonomic handle and free spinning sleeve all stored in a high density dual color foam metal case keeping contents secure. Laser etched parts list on the lid gives you the ability to identify missing parts quickly. Rubber feet keep the set secure on most surfaces. High quality sockets have knurled finger grips for hand and machine use. Also included is a 15° wobble extension for limited clearance work. The set features two free spinning extensions (short and long), one sliding T-handle breaker bar for stubborn bolts and one universal joint for hard to reach applications. All Products are backed by Wera's lifetime warranty. The 05003645001 Wera 8100 SC 2 Zyklop 1/2'' Metric Ratchet Set is one of thousands of quality tooling products available from MRO Tools. 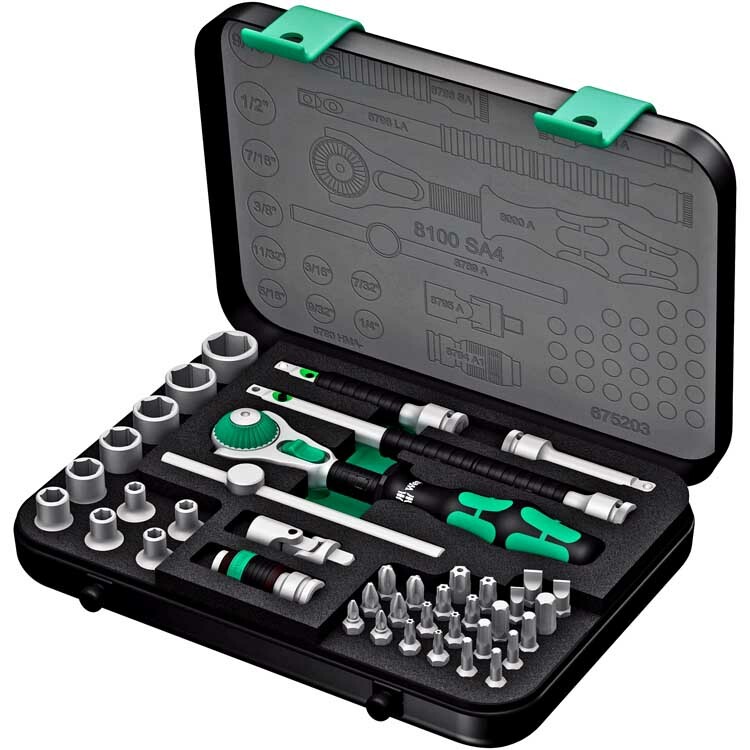 Please browse Wera Tools Top Sellers for tools similar to the 05003645001 Wera 8100 SC 2 Zyklop 1/2'' Metric Ratchet Set. 05003645001 Wera 8100 SC 2 Zyklop 1/2'' Metric Ratchet Set description summary: All sets feature Wera's multiple position head, ergonomic handle and free spinning sleeve all stored in a high density dual color foam metal case keeping contents secure. Quantity discounts may be available for the 05003645001 Wera 8100 SC 2 Zyklop 1/2'' Metric Ratchet Set. Please contact MRO Tools for details.